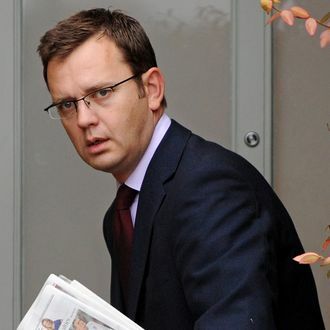 Former News of the World editor Andy Coulson, who later served as communications director to British Prime Minister David Cameron, has been arrested and charged with perjury for alleging lying under oath about phone hacking. Coulson is accused of giving bogus evidence about his knowledge of hacking at the Rupert Murdoch–owned tabloid to the high court in Glasgow during politician Tommy Sheridan’s own perjury trial in 2010. “I don’t accept there was a culture of phone hacking at the NoW,” Coulson told the jury at the time. “There was a very unfortunate, to put it mildly, case involving Clive Goodman. No one was more sorry about it than me; that’s why I resigned.” Coulson bailed from the paper when phone hacking first bubbled up as supposedly isolated misconduct in 2007, and he was forced from his Downing Street post more than a year ago as the scandal grew. Now he joins Rebekah Brooks, another former Murdoch insider, in facing criminal charges not tied directly to the hacking but to the cover-up.